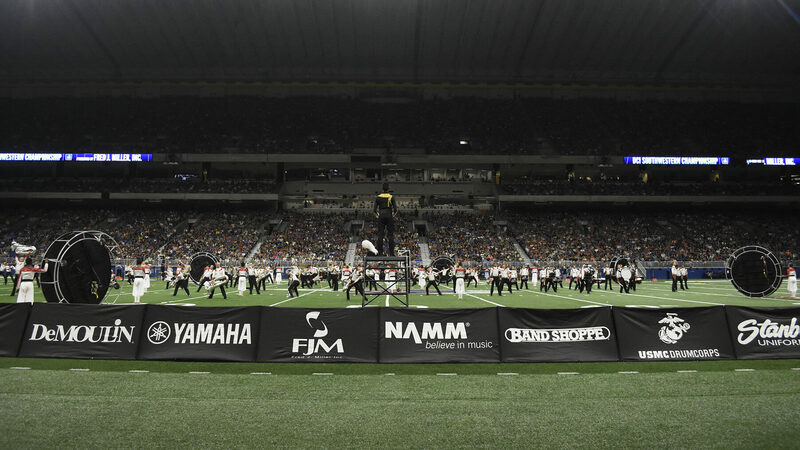 The DCI Southwestern Championship presented by Fred J. Miller, Inc. was the first and last time all World Class corps will meet on the same day until the DCI World Championships Prelims in Indianapolis on August 10. View all scores from San Antonio. Blue Devils (1st – 90.100) won the show by 0.475 over Santa Clara Vanguard (2nd – 89.625) by slight advantages in all three of the main categories of Total General Effect, Total Visual, and Total Music. Vanguard won Percussion, but placed 4th in Brass. Only 0.45 down from SCV was Carolina Crown (3rd – 89.175), placing 1st in Brass and Music Analysis, but finishing 8th in Color Guard. Bluecoats (4th – 88.025) finished 6th in Color Guard and 4th in Total General Effect, despite taking 1st from one of the four General Effect judges. The Cavaliers (5th – 87.000) were pretty even across all captions except Color Guard, which they won. Boston Crusaders (6th – 85.625) were 6th or 7th in all captions. The Cadets (7th – 84.975) were 5th in Color Guard and 6th or 7th in everything else except for 8th in Music Analysis. Phantom Regiment (8th – 83.350) was 8th or 9th in all total captions, but took 4th in Color Guard against Blue Knights' 13th place finish in that caption. That one caption alone dropped Blue Knights (9th – 82.525) under Regiment, as all other captions finished between 7th and 9th. Crossmen (10th – 80.250) finished 10th or 11th in all captions. Blue Stars (11th – 80.050) were between 10th or 12th in all captions, trading many caption placements with Crossmen. Mandarins (12th – 78.325) traded captions with Madison Scouts (13th – 78.025), with the 0.70 advantage over Scouts in Color Guard calling the matchup. The Scouts finished 0.30 under Mandarins, but with the Color Guard score being divided in half before being added to the total score, that 0.35 difference in the guard score pushed the Wisconsin corps out of the top-12 finishers in San Antonio. The Academy (14th – 75.800), Troopers (15th – 73.975), and Colts (16th – 73.675) were even keel across the score sheets. Within the next close grouping of three corps of Spirit of Atlanta (17th – 71.425), Pacific Crest (18th – 70.625), and Oregon Crusaders (19th – 70.150), Pacific Crest's 14th-place finish in Visual Analysis was the most notable. Genesis (20th – 67.900) finished atop Seattle Cascades (21st – 67.000) based on minor advantages in most captions and a 0.70 advantage in Brass. (Remember only General Effect isn't first divided in half.) Jersey Surf (22nd – 63.525) bested Pioneer (23rd – 61.225) in all captions except for Color Guard and Brass. Guardians, the only corps in Open Class competition, scored 58.925.